This corded necklace is made using waxed cording for a beautiful piece that will hold it's shape well. It measures 16 inches with a center jeweled piece that adds over 2 inches. It is done in turquoise, lime green and yellow. 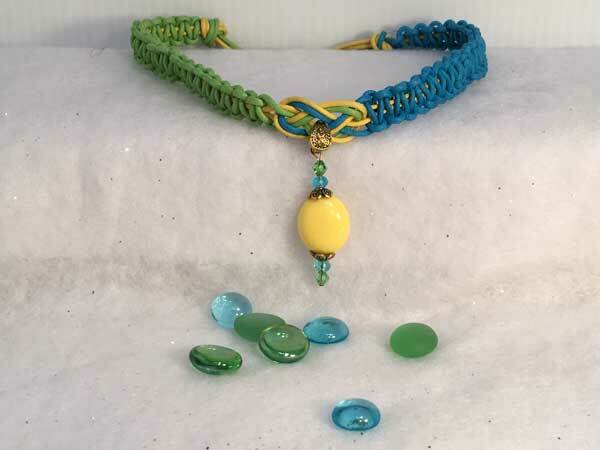 The jeweled piece starts with a gold bail and consists of a large, acrylic yellow oval that is surrounded by gold spacers, fully-faceted blue rondelles and green bicone crystals. The piece is finished with a lobster claw clasp and chain for versatility of length. This one also features a removable bail, so that the jeweled piece can be taken off and worn separately.